I never thought I would post a recipe for chocolate brownies. There are a million-and-one takes on the brownie out there but not one has lived up to my expectations. There are the tooth-jangling over-sweet versions, the much too 'cakey' ones, the brownie that's really a chocolate and the 'let's throw everything in' options. Finding a recipe that suits everyone is a challenge. The kids don't like the chocolate too bitter; the adults don't want it too milk; others can't abide nuts. I give up. At least for a while. Then inevitably someone utters those dread words "can we have brownies", and I'm back on the quest for a good recipe. I reach for my cuttings file - am I the only person who still does this in the age of the internet? Biscuits to Vegetables by way of Eggs, Game and Preserves, scraps of paper carefully filed away in case they should disappear into the ether of the on-line world, or a fat finger should find the delete button. There it was, an, as yet, untried recipe filed under 'Puddings, incl cakes' (such is my patent filing system). OK, I didn't have all the ingredients - the wrong chocolate and nowhere near enough walnuts - so a bit of artistic licence would be coming in to play. But look where sticking rigidly to recipes had got me up to now. So thank you Tom Kitchin for the sound recipe, and excuse my tweaking it out of necessity. By using two-thirds dark chocolate (70% cocoa solids) and one-third milk (34% cocoa solids), hardly any walnuts and going easy on the vanilla, I produced a brownie everyone liked - even me. Finally, I've got my recipe. Just need to make sure I file that scrap of paper. Pre-heat the oven to 170C (Fan 150C)/Gas 3. Line a 30 x 20cm x 4cm baking tin with baking parchment. Put the butter, 150g dark and 50g milk chocolate in a heatproof bowl and place of a pan of simmering water until melted. Stir until smooth then remove the bowl from the pan and allow to cool a little. Sift the flour, salt and baking powder together into another bowl and set aside. In a third large bowl, whisk the eggs, sugar and vanilla extract until slightly thickened. Fold in the melted chocolate/butter mixture then gently fold in the sifted flour followed by the remaining chopped 50g dark and 50g milk chocolate and the chopped walnuts. Transfer the mixture to the prepared baking tin, gently spreading it into the corners. Bake for 20-25 minutes. The top should be nicely crusted but the brownie still soft in the middle. Remove from the oven and cool for 10 minutes. 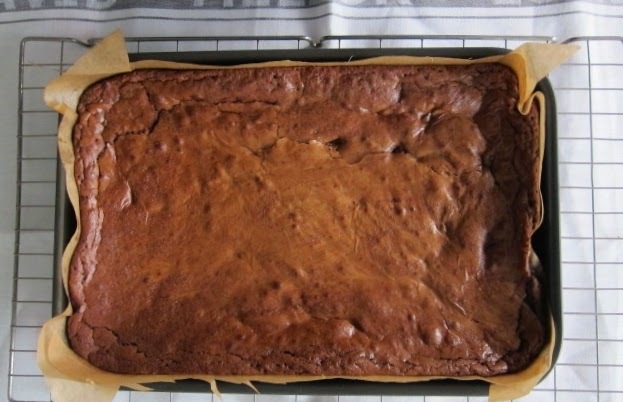 Carefully lift the cake out of the tin and allow to cool on a wire rack before cutting into 15 squares.